Charlotte home inspector Preston Sandlin wants to make a difference. Inspired by Tom’s Shoes he likes to pick a charity every other month to donate a portion of their inspections at his company; Home Inspection Carolina. 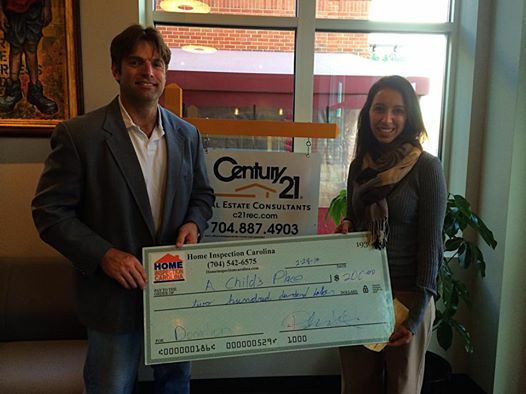 He decided to give to A Child’s Place at the grand opening of Century 21 Torrington. A Child’s Place (ACP) works to erase the impact of homelessness on children and their education. ACP began in 1989 when a group of women were walking through the cemetery in downtown Charlotte and noticed a group of kids playing. When asked why the kids were not in school the children explained that they were not allowed to enroll in school without a permanent address. The group of women began offering school for this group of 27 children in a one room schoolhouse provided by First Presbyterian Church with a teacher from CMS. In 1989, the McKinney-Vento Act was passed protecting the educational rights of homeless children ensuring they are provided the necessities they need to regularly attend school. Since that first class of 27 ACP client children we have grown to help 2,656 homeless children during the 2012-13 school year. The national graduation rate for homeless children is below 25%. ACP works to remove these barriers for our client children to attain their education and make school the most stable part of their lives. We provide educational and emotional support services as well as medical referrals to keep our client children healthy and in the classroom. Most of our client families are the working poor. For them, homelessness is not a way of life; it’s a time in their lives. By minimizing the impact of this difficult time on the children and their academic growth, ACP contributes to their likelihood of breaking the cycle of poverty. Stability and education are key solutions to solve the homeless problem here in Charlotte. The relationship between education and income is one of the best-documented in economics: those with more education make more money. For every year a child progresses through school, the likelihood of being poor and homeless as an adult decreases. Source: A Child’s Place Client data, 2010-2011; Levin, H., Belfield, C., Muennig, P. and Rouse, C. (2007), The Costs and Benefits of an Excellent Education for All of American’s Children.New York, NY:Columbia University. We can pay now or pay later. It costs ACP $985 per year to serve a homeless child. Compare that to $62,000 for that same child to be in our juvenile justice system or $39,000 to be incarcerated as an adult or for the costs of substance abuse treatment or government assistance later. Helping these children now not only fulfills their hopes and dreams; it creates better citizens and employees for our community. In the 2011-12 school year, 97% of A Child’s Place students were promoted to the next grade (compare to 64% nationally) and 81% read on grade level (compare to 48% nationally and 68% of Charlotte-Mecklenburg School students).